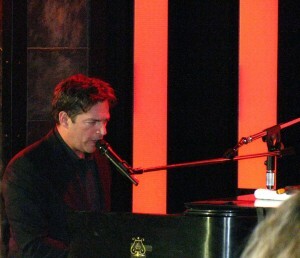 A few weeks ago, I posted when we found out that Harry Connick, Jr would be performing at the Blissdom Conference in Nashville. At the time, the plan was to have a meet and greet – we’d all do photos with Harry and get to meet him. Well…. apparently, there’s a big football game on tomorrow? And one of the teams playing is from HCJ’s hometown of New Orleans? I love that he didn’t bail – I mean, the SuperBowl, right? That’s huge. But, he didn’t cancel. Instead, he shifted things around on his schedule and came to perform last night and today he’s off doing SuperBowl-y stuff. We were glad he still came to perform. Not only was Harry entertaining (and so funny! ), but his band? FREAKIN’ AWESOME. Actually – let me go even further: his band blew me away. Two of his musicians (including the saxophone player, pictured above) are residents of Musicians’ Village in New Orleans which provides a home for the artists who have defined New Orleans’ culture so strongly. 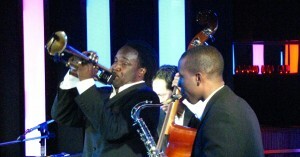 The Musicians’ Village was conceptualized by Harry Connick, Jr and Brandford Marsalis, and is supported by donations. After a rendition of “When The Saints Go Marching In”, they finished and we were all able to quickly meet and get our pics snapped with HCG – it was so fast that I didn’t have a chance to say something stupid to him. I think we can both count our blessings on that one. *Pictures taken by me. Unfortunately. I can’t wait to see what the shots look like from better cameras than my own! That is AWESOME! I love Harry, even if he is rooting for the Saints.